What is it to see the world, other people, and imagined situations not just as morally compelling, but as making personal demands of us? What is it to experience stories as speaking to us individually and directly? Kierkegaard’s Mirrors explores Kierkegaard’s unique and challenging answers to these questions. Beginning with the structural account of consciousness offered in Johannes Climacus, this book develops a new phenomenological interpretation of what Kierkegaard calls ‘interest’: a self-reflexive mode of thought, vision and imagination that plays a central role in moral experience. 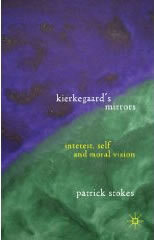 Tracing this concept across Kierkegaard’s work takes us through topics such as consciousness, the ontology of selfhood, ethical imagination, admiration and imitation, seeing the other, metaphors of self-recognition and mirroring, our need for transcendent meaning, and the relationship between scholarship and subjective knowledge. ‘Interest’ equips us with a new understanding of Kierkegaard’s highly original normative, teleological account of moral vision.